Donald Wyman (Malus 'Donald Wyman') is a quite special flowering crab apple tree, as its fruit persists well into February in most years, thus providing good winter colour. A strong growing round-headed tree with pink buds, white flowers and dark green foliage. 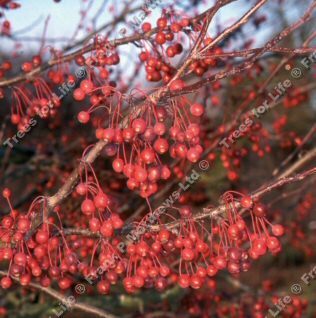 The fruits are small and bright red. This tree is supplied at a height of between 150 - 200cm in a 7 litre container for year round planting and better results than from either bare-root or root-balled stock.